WHAT MADE Harold Hodge Jr. believe he was entitled to peacefully stand with a protest sign on the outdoor plaza of the US Supreme Court? A 1949 federal statute makes it illegal to assemble or demonstrate on the Supreme Court grounds, or to display there any "flag, banner, or device" expressing a public message. Hodge, a Maryland college student, violated that law four years ago by standing in front of the court building wearing a placard around his neck that read: "The U.S. Gov. 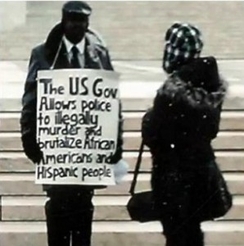 Allows Police To Illegally Murder And Brutalize African Americans and Hispanic People." Hodge was ordered three times to leave the plaza and then arrested, but he claims he had a First Amendment right to be there with his sign. Last month the US Court of Appeals for the D.C. Circuit ruled that Hodge was wrong. But where could he have gotten the idea that freedom of expression belongs at the Supreme Court's doorstep? From the Supreme Court itself, perhaps? Time and again the high court has extolled Americans' right to expressive freedom in the public square. When "speech [is] at a public place on a matter of public concern, that speech is entitled to special protection under the First Amendment," the court declared in 2011, ruling 8-1 that even the egregious funeral pickets of the Westboro Baptist Church were shielded by the Bill of Rights. The justices weren't being hypocritical: Nearly 30 years earlier, they had upheld the right of a protester named Thaddeus Zywicki to distribute leaflets on the sidewalk surrounding the Supreme Court's own sober enclave. "Traditional public forum property occupies a special position in terms of First Amendment protection," the court had held unanimously in United States v. Grace. Such a public venue doesn't lose that "historically recognized character" simply because it "abuts government property." The Supreme Court invoked the Grace decision last year, in yet another unanimous affirmation of the right to peaceful expression — McCullen v. Coakley, which struck down the no-free-speech "buffer zones" outside abortion clinics in Massachusetts. Grace dealt with the question of free speech only on the public sidewalks bordering the Supreme Court grounds; the status of the court's grand marble plaza — a vast oval, 252 feet long and 98 feet wide — it left for another day. For decades, that has meant that protesters, sign-holders, and pamphleteers are allowed to freely express themselves on the sidewalks. Meanwhile the elegant terrace in front of the courthouse, as Harold Hodge found out, is still off-limits to anyone wishing to communicate a message. Except that it isn't, really. In challenging the 1949 law under which he was arrested, Hodge pointed out how selectively it has been enforced. For example, he wrote, "litigants and their attorneys have been ... permitted to hold press conferences and make speeches on the plaza. Tourists and attorneys on the plaza waiting in line to attend oral arguments are permitted to engage in conversations about matters before the Supreme Court. More recently, commercial film crews have been allowed to shoot scenes for movies on the plaza of the Supreme Court." Maybe so, said the Court of Appeals, but that doesn't mean the Supreme Court plaza is a true public forum. Congress can amend or repeal the 1949 law if it wishes to, but until then the Supreme Court's immense front yard is exempt from First Amendment protection. On the other hand, Congress's own vast grounds right across the street are a public forum, the D.C. Circuit has ruled. Protesters, demonstrators, and sign-holders have a constitutional right to assemble there whether Congress likes it or not. 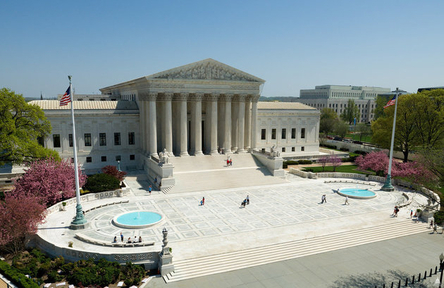 What is the Supreme Court's huge plaza if not a great public open space where Americans should be able to gather and speak freely? Why the difference? Because, the appellate court argues, members of Congress are politicians, and politicians are expected to heed public sentiment. But judges are above grubby politics. There is a legitimate "interest in preserving the appearance of a judiciary immune to public pressure." That's why the grounds of the Supreme Court must be cleansed of free speech, see? Oh, somewhere in this favored land, there may be jurists so delicate that their judgment would be compromised by the mere presence of a guy holding a sign outside a courthouse. But if the US Supreme Court isn't undone by the daily protests on its sidewalk, it can probably handle free speech and assembly on its huge open-air plaza. From every corner of the nation, Americans turn to the high court for vindication of their First Amendment liberties. If freedom of speech and assembly belong anywhere, it is in the majestic open forums of the nation's capital. A no-free-speech "buffer zone" on the Supreme Court plaza is ludicrous. The justices should make a point of saying so.